Our Most Popular Photo Album! Our most popular Pioneer 4x6 Photo Album! This large 4x6 album has a faux leather cover with gold accents. Holds 300 4x6 photos. 6 per page with memo area. Availability: Ground orders usually ship in 1-2 business days except Burgundy (Out of Stock), Hunter Green (Out of Stock), Royal Blue (Out of Stock). Add To Cart to view ship rates and delivery dates. 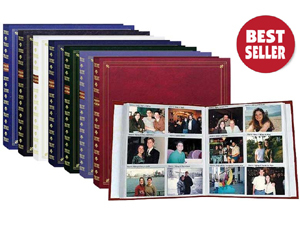 Our Best Selling Pioneer 4x6 Photo Album! This large 4x6 album has a faux leather cover with gold accents. The 6-up style pages inside initially hold 300 4x6 photos, 6 per page and include a memo area. It accepts acid free refill pages to hold well over 1000 photos. Overall album dimensions: 14-1/4" x 14-1/4"